Already an impressive combination of advanced technology and sophisticated design, Marathon Show Coach #1213 soon evolved into a true tech marvel. 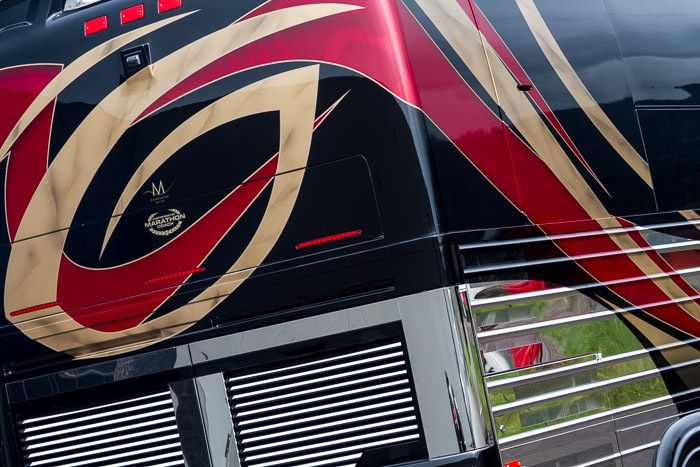 Acquired upon completion by a Seattle-based technology group, this motorcoach received extensive upgrades and soon became the most technologically advanced coach Marathon has ever produced. Since connection is key for this organization, a Broadband Global Area Network system was installed, ensuring high-speed internet and phone service are available from any location, with the only exception being in extreme polar regions. In addition, there are four cellular antennas and three wireless access points on this bus. Of course, there’s also the ability to take care of business needs by conducting video conferences, responding to emails and taking care of whatever arises with colleagues no matter where one finds oneself. Interestingly, with the technological additions, the team at their headquarters on the West Coast can remotely reboot their network as well as load, change or update the content because this coach has a two-way satellite. Aside from the connectedness, another benefit of all of this technology is a truly multi-media home theater system that meets the specs of a high-end, dedicated home theater capable of providing world-class entertainment, even while on the road. 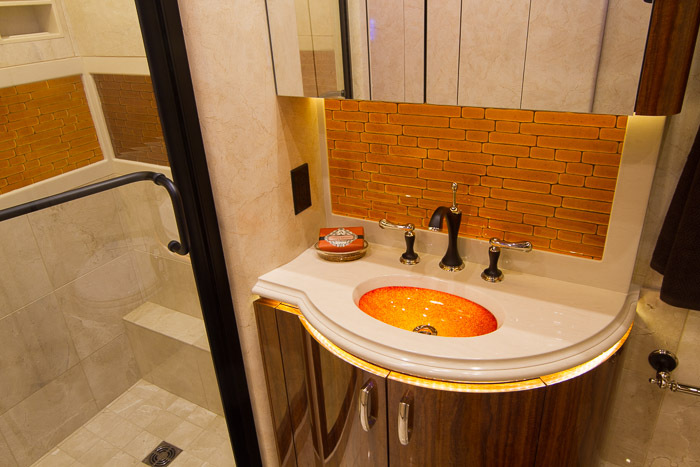 The four iPorts that were installed blend seamlessly with the décor and enhance functionality. 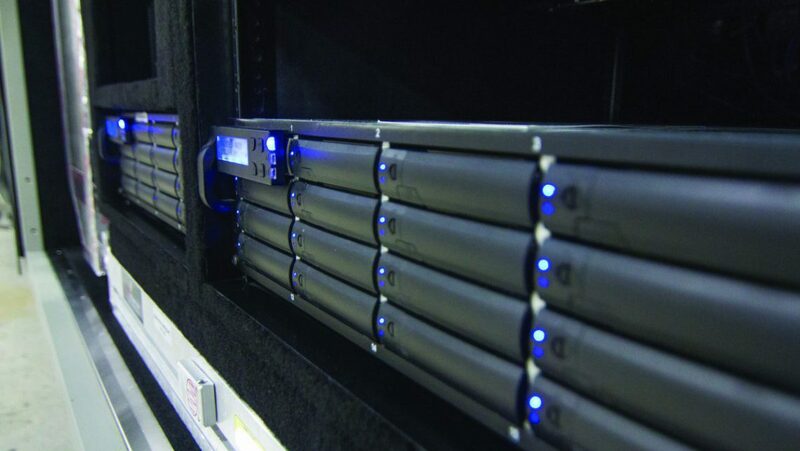 Integrated with the Crestron system, the audio, video, lighting, network, shades, lights, awning, generator and more can be controlled by an iPhone or iPad. Amid the plethora of electronic devices, sophisticated systems and myriad of technology, the coach’s interior provides a luxurious place to call home. A leather recliner, striking sofa and facing dinette provide plenty of seating for family, friends and work associates. Because documentation is a must, a printer was built into the occasional table with a paper tray and supplies’ organizer. When not in use, these items are completely out of sight, yet are quickly and easily available. When it’s time to call it a night, this coach provides innovative and comfortable sleeping options. The king size bed adjusts to the perfect lounging position for maximizing the action and adventure playing out on the 50-inch LED backlit LCD television. However, more importantly, people can easily maneuver past the bed to the back server even when the slides are in. Children will be comfortable in this coach as well. Unlike many motorcoaches where friends or family members are often a mere afterthought, this coach provides two bunk beds, each with its own audio/visual system. And when traveling without guests, the space easily converts to a wardrobe with a push of a button. 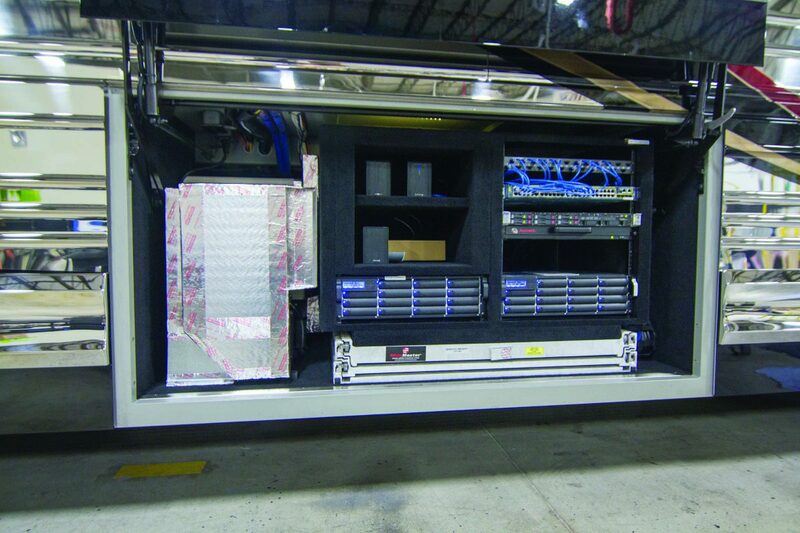 Of course this customized Marathon Coach is about more than mere technology. It’s about gorgeous décor, livable space and tasteful luxury. 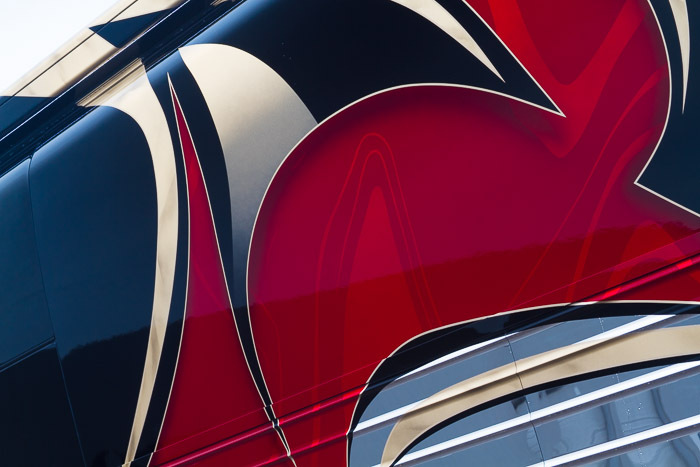 The exterior is candy red over crystal flake, gold marbling and black with an abundance of polished stainless steel. The interior is warm and inviting, with hardwood flooring contoured with stone tile, contrasting wall and cabinet laminates, rich dark leathers and illuminated handcrafted glass for the backsplashes and sinks. 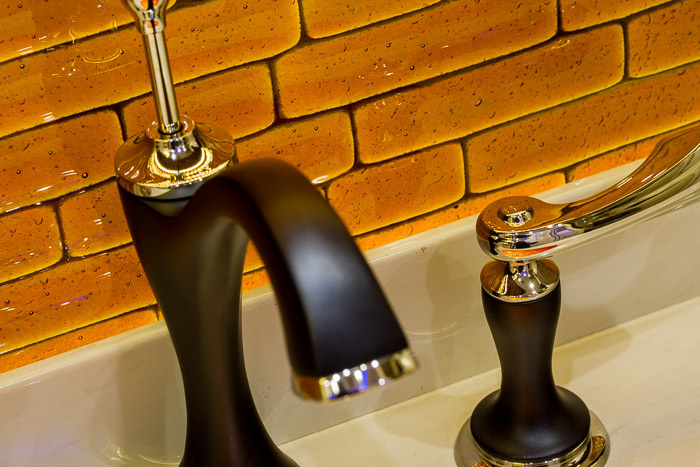 The glass backsplashes are a beautiful amber/root beer color with trapped bubbles with each piece of glass being a one-of-a-kind, handmade creation by a local artist. 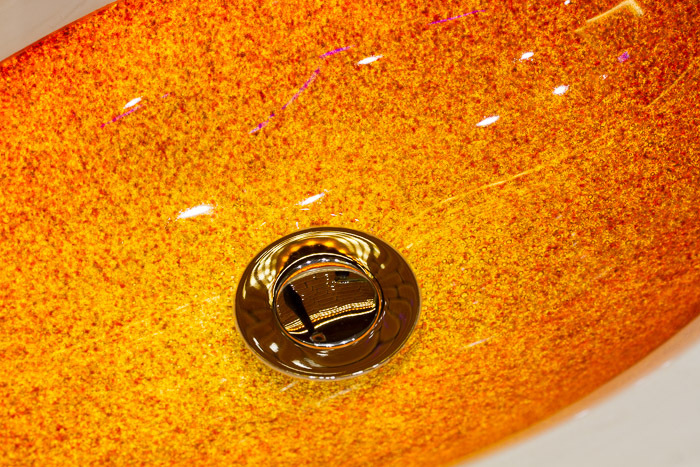 Similarly, the made-to-match illuminated glass sinks radiate from light to darker amber and were handcrafted by the same artist. 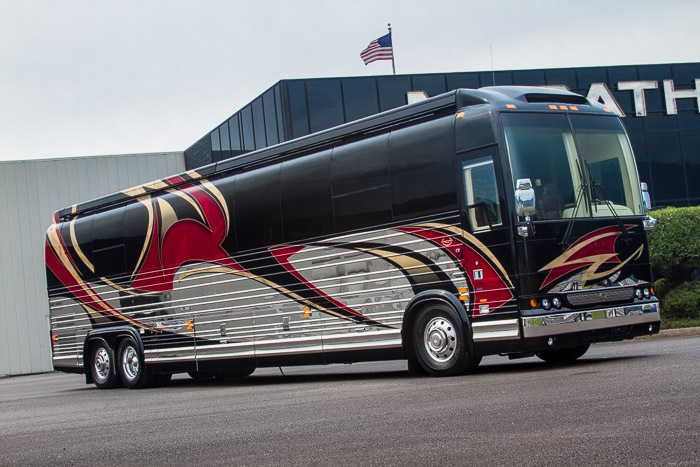 Although primarily designed for touring and sightseeing, this Marathon Coach with cutting edge technology will allow its owner to conduct business worldwide, fulfill entertainment needs and provide a warm, comfortable environment while on the road.